town of Pushkar should not pass up the opportunity to go on a camel safari. A camel safari in Pushkar offers an irresistibly romantic chance to explore the sweeping vistas of the desert landscape. 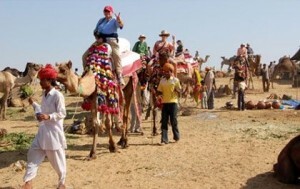 Camel Safari in Pushkar is a once in a lifetime experience. Explore the rugged terrain of the Great Indian Desert of Sahara, while using camels as your load bearers. Sleep under the starlit skies. A traveler could not ask for a better introduction to the stark beauty of this place otherwise more famous for its spiritual activities. There is not an iota of doubt that a visit to Pushkar is incomplete without experiencing a camel safari.